A number of Black Swan events have been ignored / killed by the markets (for the time being). Apart from Nikkei, there was no signficant follow through of selling in other markets, and dips have been bought hand over fists. Also, there have been news of significant buying of Japanese equities by western investments. Perhaps, this was among the the main reason for strong buying of Yen on 16 March 2011, rather than pure speculation or repatriation (Yen surge was later fought by G7 intervention). 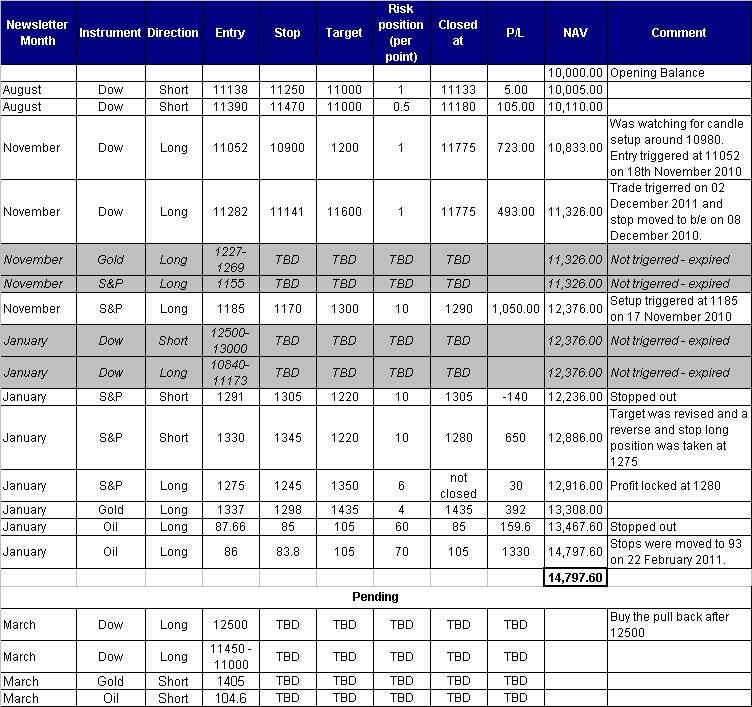 Several trades were triggered based on previous analysis of January newsletter, details can be found below. We had both Long and Short levels charted out, but none of them were set up. Daily chart shows that the price broke below 50SMA on 10 March 2011, but since then it has reversed and is now above both 50SMA and 20SMA. It is still within long-term bullish channel. Weekly chart showed a lot cleaner price action, after bouncing off 200SMA on weekly chart (as noticed in January newsletter), it created a doji type of candle (commonly called pin bar) and then continued the uptrend. Looking back at it, although I had weekly 20SMA as buying level, but I did not update my levels based on the movement of 20SMA. Next resistance is at 12500, after which any pullback should be bought with confirmation of bullish candles. Aggressive traders may look for counter trend short opportunities around that level. Alternatively, if the weakness continues, then look for buying opportunities around the support cluster between 11000 and 11450 which also coincides with 200SMA support, demand line for the bullish channel, 50% fib support zone for the rally between 9925 and 12400, and previous support based on price patterns (see chart below). If you get this much confluence confirmed by a bullish candle around this zone, you just have to BUY THAT DIP with stops and appropriate risk management. 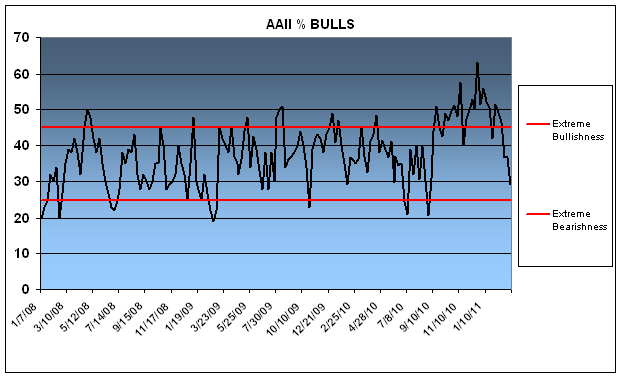 AAII bullish sentiment index has also come off its highs (see chart below), further highlighting that perhaps a mid term top is not in place yet. This one was a bit risky, but according to buy zone charted in January 2011 analysis, there is strong support between 1227 and 1269 extending upto 1300 round number figure. 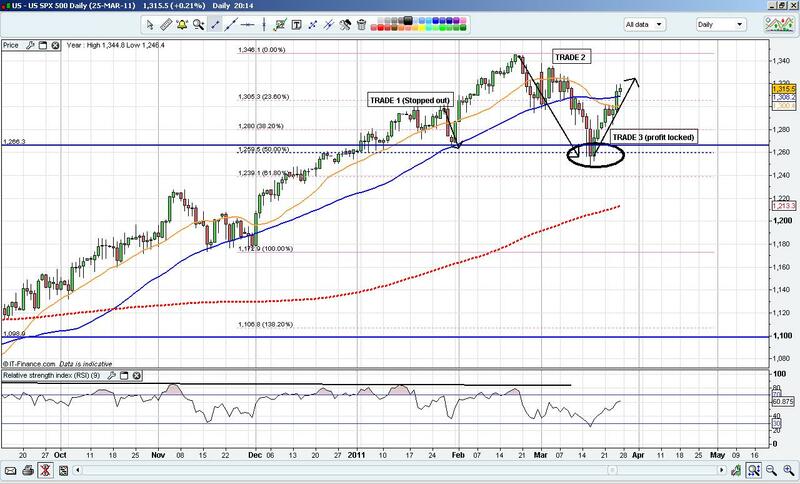 A long was triggered at 1337 after a reversal candle printed just before 1300 on 28 January 2011. 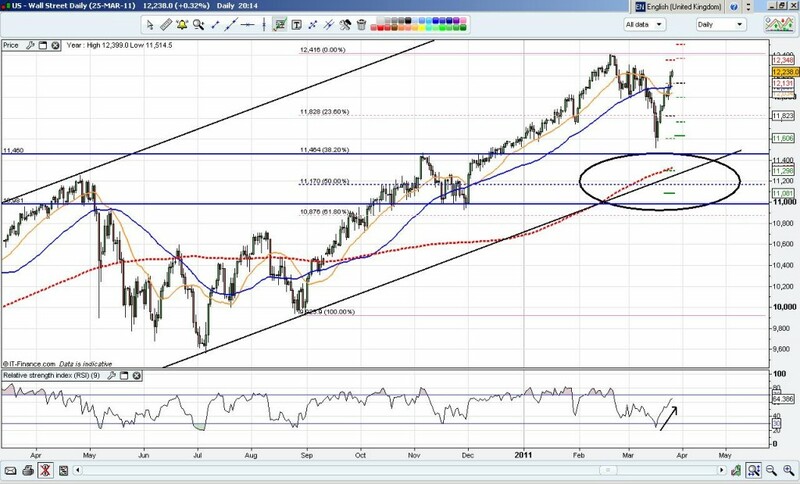 Upswing from 682 to 1227 carves out a Fibonacci extension up to 1435 as next resistance, therefore my target was 1435. Now the resistance has already come into play, and I am looking for short candles, price carved a reversal candle (doji style) on 21 March 2011, at the break of this candle on the downside; I will place shorts around 1405 with tight stops, as this is an aggressive counter-trend trade. However, the Gold bull story is far from ending – per technical structure. 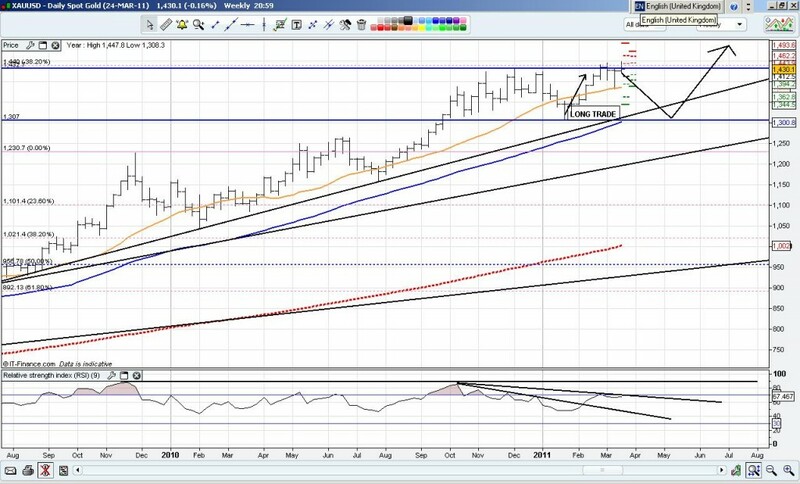 I am only looking for its reversal to the base around 1320 – 1340 region (which could again be a buying zone). Significant resistance carved out around 1302 and 1350 in January newsletter were played with shorts, and though first opportunity was stopped out, the second opportunity around 21 February 2011 made up for it quite handsomely. Also, the exit from short was based on reversing the position to longs which are still held. Long objective and exit from short around 1350 region were established as price reversed from 50% fib level around 1259 and previous price support level around 1266. Still holding the long with profit locked in as stops moved to the low of 23 March 2011 at 1280. Targeting 1350, which is previous high, before we revaluate the bias. Bullish view and trade is also supported by VIX as it bounced off its support zone around 15 as expected in January newsletter but is now in relatively neutral zone. Text book example of previous resistance becoming support was highlighted in January 2011 newsletter establishing a bullish view, the Libyan crisis was obviously not expected through charts, but it helped the fundamental backdrop of Oil’s climb. Before shorts could trigger based on January newsletter, a long trade was entered at previous support levels, which initially was stopped out, but second entry just like S&P was exited in profit at 105 because this level was highlighted earlier for looking for short entries. So, long was closed and a short entry was triggered at 104.40 on 08 March 2011. This short was also exited at reversal at the breaking of reversal candle printed on 16 March 2011. 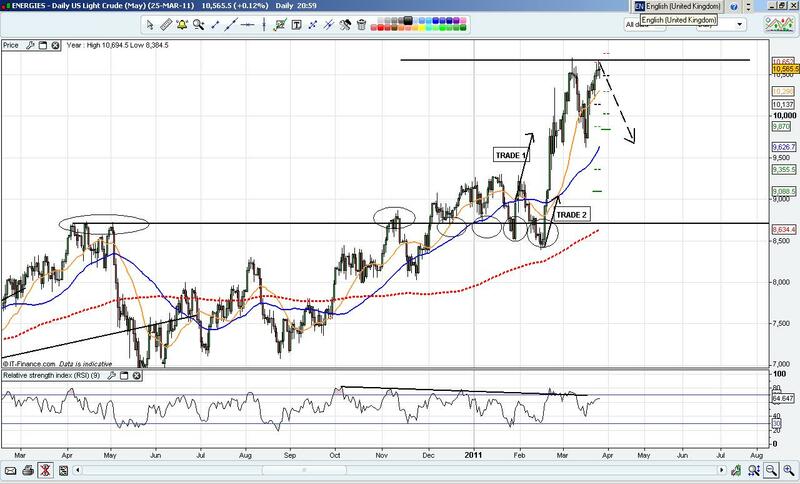 Now looking for shorts again below 104.60, as double top forms, and also RSI also confirms weakness. Perhaps too many trades were taken in Oil. 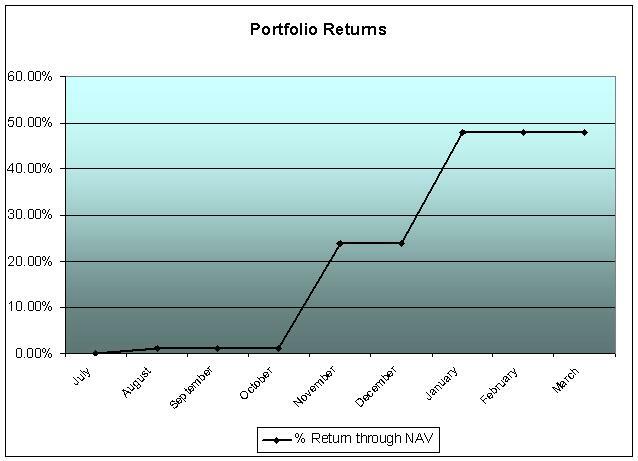 However, due to the volatility the opportunities have been plenty as well. Levels and zones are potential pivot areas – For trade entries, the price patterns / candles around these levels/zones should be observed or pyramid your entries with money management for aggressive trading approaches. Trading in the financial markets is a challenging opportunity where above average returns are available for educated and experienced investors who are willing to take above average risk. However, before deciding to participate in financial markets trading, you should carefully consider your investment objectives, level of experience and risk appetite. Do not trade / invest money you cannot afford to lose. This website/newsletter is neither a solicitation nor an offer to Buy/Sell/Hold. No representation is being made that any account will or is likely to achieve profits or losses similar to those discussed on the website/newsletter. The past performance of any trading system or methodology is not necessarily indicative of future results.